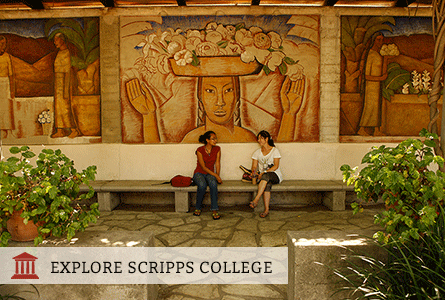 A Scripps education begins with the Core Curriculum in Interdisciplinary Humanities, the College's signature interdisciplinary approach to learning. Students can choose from 65 majors and programs of study. View full list here. The student-to-faculty ratio is 10:1 and the average class size is 16 students. Students can cross register at the other Claremont Colleges and also pursue a major offered by another Claremont College. Students interested in engineering can participate in 3-2 programs with Harvey Mudd College and earn both a B.A. and a B.S. in 5 years. Pre-professional advising is available to students interested in pursuing a career in the health professions, law, or business. 60% of students spend at least 1 semester pursuing off-campus study to 86 cities in 47 different countries through 120 approved programs. Within 5 years of graduating, approximately 60% of Scripps alumnae report that they have completed or are pursuing graduate programs.